Mussels are a the perfect summer seafood, light yet full of fresh flavor and easy to prepare! Great as an appetizer at a BBQ or summer cookout. 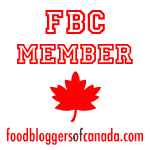 They are very versatile, spiced up with various vegetables, spices, wines, beers, and sauces! Before digging in and eating these tasty little critters, it’s important to know how to clean mussels properly to avoid making yourself sick. Dead mussels are the leading cause of food poisoning when eating fresh mussels at home. Something that’s easily avoided if you know what to look for and how to make sure your eating only the freshest shellfish. As with any seafood its important to buy a good quality product form a reputable supplier. While you can often get a good deal on seafood from a roadside truck or stand, if you don’t know what to watch for you could easily purchase mussels that are already half dead! All mussels are usually sold by the pound and come in small netted bags. Before shipping to various grocery stores and other suppliers, mussels are stored in large tanks of filtered seawater to keep them alive. They are then sorted, and bagged, all while being kept wet and cold to keep them as fresh as possible. If left out of fresh seawater for to long though, mussels will naturally start to die. So how do you tell if mussels are bad? Dead mussels will (usually), have an open shell and will float. Live, fresh mussel shells are generally closed and sink when submerged in water. Here’s the kicker though. If you come across an open mussel, it is not necessarily dead! To check, tap the shell, or squeeze it closed, if the the mussel shell closes and stays closed, then the mussel is alive! The easiest way to test this is to simultaneously wash and debeard the mussels while checking for dead mussels. Wait, What Does ‘Debearding’ A Mussel Mean? Most mussels will have a little tangle of stringy, hairy looking bristles or ‘beard’ attached in between the hinge of the shell. This is what the mussel (and many other mollusks) uses to attach themselves to rock, rope, etc. Debearding refers to the action of removing this ‘bear’ while cleaning mussels. While not in-edible, these little bristles are not very enjoyable to consume, and are most often removed before cooking. Since it’s quite a time consuming task, it is most often done in fine dining establishments. When cleaning mussels at home, it is best to do so right before you plan on cooking and eating them. This way you know you are only eating the freshest mussels. If you ned to store the mussels after washing, that’s totally ok, but be aware they should be washed and checked again before cooking. 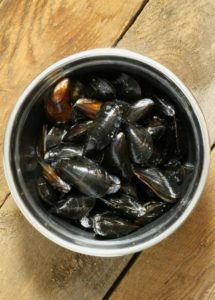 Dump the entire bag of mussels into a bucket or sink of fresh cold water. Tap water is fine as long as it is COLD! Swish the mussels around with your hands to dislodge any debris or dirt that may be clinging to the shells. You may be surprised how dirty the water gets! Start picking out the mussels all the while checking to make sure the shells are closed. If you come across a mussel with an open shell, tap it on the counter or edge of the bucket and see if it closes. Place the washed live mussels in a clean container which can be stored in the fridge or a bowl if you plan on cooking right away. As you are picking the washed mussels out of the water, de beard any mussels that still have the bristles attached. Simply grab a hold of the beard and yank it of. Heads up! It can be quite stubborn and tough to remove! Once you have all the washed and cleaned mussels in your clean container, cover the mussels with a soaking wet cloth or newspaper. It’s best to keep as much air out as possible. The mussels can be stored in a fridge for up to 3 days. After cleaning your mussels, it’s important to store them properly to keep them as fresh as possible. Properly storing mussels after purchasing will also increase how long they survive in your fridge. 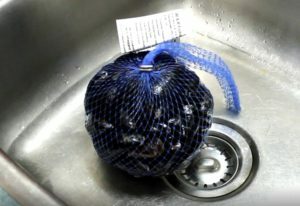 If just purchased, the mussels can be kept in their mesh bags until you plan on washing them. This keeps them contained, and they wont accidentally spill. Place the mesh bag in a suitably sized bowl, and cover the bowl with a soaking wet kitchen towel or newspaper. This keeps the mussels wet, and as cold as possible. 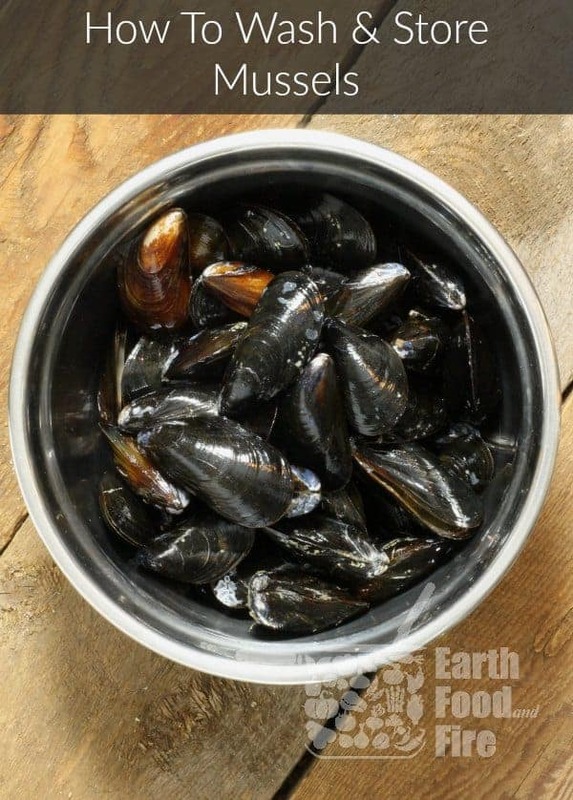 If you just washed and picked the mussels and plan on storing them for a day, place the loose washed mussels in a bowl, and again cover with a soaking wet cloth or newspaper. Keep in mind the mussels need to be quickly re-washed right before cooking. In both instances, drain of and discard any liquid that may accumulate in the bottom of the bowl every day. Mussels can be stored in this way for 3 to 4 days. Always smell the mussels after washing as well to make sure they smell like fresh seawater. If they smell foul, or rotten (it will be quite noticeable) throw them out! Looking for quick and easy mussel recipes? Try a few of these!